Fangirl Review: Peter Milligan & Juan Jose Ryp Command Myth, Monsters, and Murder for BRITANNIA #1 – Coming in September! 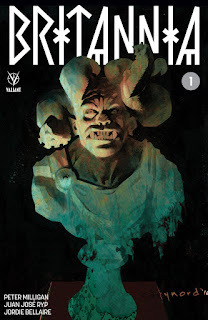 Peter Milligan & Juan Jose Ryp Command Myth, Monsters, and Murder for BRITANNIA #1 – Coming in September! This September, Peter Milligan and Juan Jose Ryp lead a psychological journey into terror, temptation, and bloodshed, only in BRITANNIA #1 (of 4) – featuring covers from world-class creatorsCary Nord (X-O MANOWAR), Lewis LaRosa (BLOODSHOT REBORN), Andres Guinaldo (Justice League Dark), Ryan Lee (Inhuman), and Dave Johnson (Superman: Red Son)!